Home > Google News > Google AdWords > Want Google's Keyword Tools? You Must Have An AdWords Account. Want Google's Keyword Tools? You Must Have An AdWords Account. As you know, the Google Keyword Tool is being replaced by the Google Keyword Planner tool in the next month or so. Google is going to shut down the legacy Google Keyword Tool. But what might be obvious to some but not all is that the Google Keyword Tool for external, non signed in users, is completely going away. To access any AdWords based keyword tool, you will need to sign up for an AdWords account. 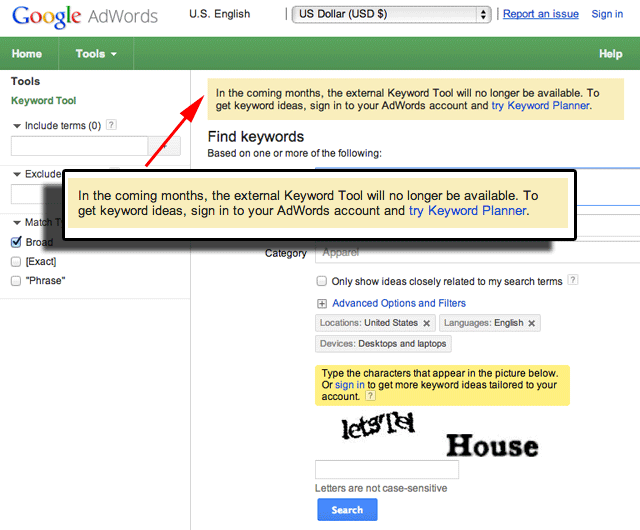 Again, you won't be able to use an AdWords Keyword tool without an AdWords account. This may upset some SEOs. Previous story: Can You Test The Google Disavow Tool?